Straight from Red Chillies to my kitchen, baked & gone in a few minutes. Ever since I laid my eyes on these crackers in Supriya’s blog, I had been itching to lay my hands on them. These got pretty popular soon after she posted them. I saw a lot of you try these out & were very satisfied with the flavorful crackers. Finally I made the Onion Crackers one afternoon, & never stopped eating (no I did not eat them all by myself) till they were almost gone. We did not realize how much these filled us up till we were done, & then we skipped dinner. I had to force ourselves to save these few ( 5 in all ) to take some photos for the blog. These few disappeared soon after the clicks. The crackers are extremely easy to make; as simple as making a dough for flatbread & cutting them out & baking them for a while. I made little changes in the procedure, I promise you it is very negligible & will not affect the outcome. In a big bowl combine flour/ maida, sesame seeds, half the onions, salt, sugar, soda, chopped coriander leaves, green chillies and mix well. Add the oil & the butter and spread it to the mix. Big and uneven lumps will form but that is ok.
Add the warm water and make thick dough. At this point if you feel there is too much onion, do not worry, the more the better taste. Knead well for about 2-3 minutes and cover this with a damp cloth. Keep it aside for 30 minutes. Gently knead in the rest of the chopped onions. Do not worry if they are not mixed in evenly. Take a round cookie cutter or a glass or small bowl with sharp edges & cut out cookie rounds. Repeat this process for the remaining dough as well. Place the round cut outs on a greased cookie sheet. Poke holes on all of them with a fork, this way the cracker will not puff and also the air will go out while baking. Sprinkle some coarse salt on the cookies. Bake for about 25 to 30 minutes until they are brown. I will have to give 5 star Plus for these. Do try these out, please. I cannot tell enough how addictive these are. They are absolutely great as snacks with tea; my hubby had his with some Sriracha (hot sauce)! I would think they would do great with soup too. Hi! This looks very interesting and I have to try it. Thanks for sharing. It’s so sad you are not my neighbour else I would also have laid my hand on it. Ho,splendid as you said..none can keep away..slurp..
OMG these sound delicious, I surely would have eaten them all by myself. Interesting one!!! 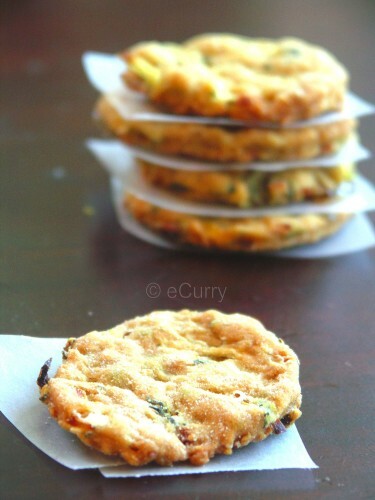 Peyaji but not quite….the baking makes it relatively low-oil snack!! ah ha re…jodi eta ekhun muri aar chaa diy khete partam……jibey jool aschey !! I love homemade crackers, they’re so much better than store bought! These look delicious. 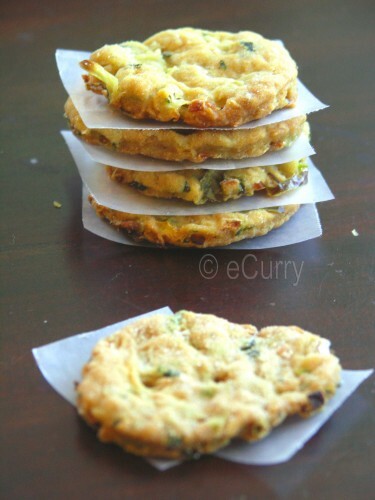 I have the same recipe bookmarked from Red Chillies, and now I really think I should hurry up and try it. “taking a big bow” thank you dear Soma and so glad you liked it. I do have to thank Ramya for the original recipe though! I imagine these would disappear fast–they look great! They’d make a perfect snack for a party. Those onion crackers look fantastic! Love the pic. wow!! This is great recipe!! I have been looking for such savory cookies from so long. Thanks for sharing. nice snaps. I’m convinced! These treats look incredibly delicious! I can tell they are addictive. Impressive and beautiful, Soma. The flavors sound amazing. i’ve been meaning to make these for a while…you’ve made such a strong case for them that i think i should just roll my sleeves and make them right now! BTW, re. the pomelo in the mango sago dessert, pomelo is native to SE Asia – it basically belongs to the grapefruit family, (will update my post as well) so as such you can use grapefruit as well. sorry for hogging your space with this! Gorgeous! I love all the flavors here. I’m not surprised they were all gone! 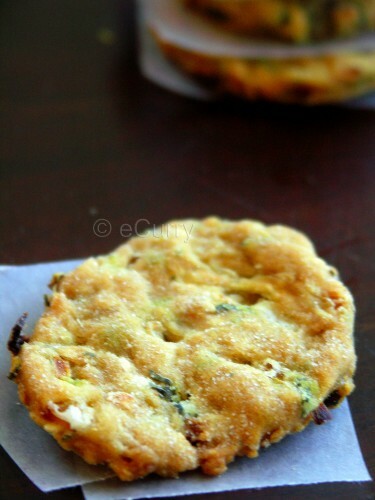 Love those crackers(or baking nippatu)..nice click..
these onion crakers look fabulous. love it very much.. pictures are stunning!! Oh you made them too 🙂 these are on my list from a long time, yours have come out perfect, gosh i really need to try this asap! Oh this is wonderful! I will make it very soon. Thank you! Thanks everyone. & a big Thanks to Supriya.. I would tell everyone to give this a try atleast once! I have had my eye on these for a while now, yours have turned out beautifully, cannot wait to try this ! I love these crackers! And I have all the ingredients, woohoo! Oh … my … Oh … my … these look so gorgeous. I must live in a cave – or maybe it’s just the heat – because I’ve missed these. Skipped dinner after these. I think I get the picture. These savoury crackers sound really good! WOW! these onion crakers look fabulous! Thanks a lot!!! I tried this recipe for onion crackers, myself and had a hard time getting them to stick together. They tasted delightful though! I too tried this and it was gone in minutes…yet to post it! I’m just getting ready to put this gorgeous recipe together. My only query is: In the first step of combing dry ingredients, how much salt? The only quantity of salt I see is the bit of coarse salt you put on top just prior to baking. In the meantime, I will depend on my “EpiCurious” sensibilities. Sorry could not reply earlier.. I am on vacation:) Use salt as per your taste. I usually do not mention the amount of salt, but I do see here that I have missed writing the “salt” in the list of ingredients. Will update it.. thanks! Nice recipe, I will put it all together one day soon. For the moment though, I was only looking for a basic saltine recipe, as I need dinner ready in about 45 minutes. I cooked a vegetable beef soup, and already used yesterdays loaf of sourdough bread in a bread pudding. Was only after having the soup nearly ready that I realized I have no bread, nor crackers. So, anyway, your recipe looked quick and simple ( and good ) enough without using all the extras, though I did throw a few things in there…I decided to improvise going on your proportions to half the amounts, and should know in about 15 more minutes if I have Saltines, Ritz, or a total blitz…I feel certain they will come out great. thanx for the simple recipe, I am making it right now! making it right now ! !